Finding vesicles inside a plant cell wasn’t that unusual; plant and animal cells use vesicles for all sorts of things, such as ferrying molecules around the cell or recycling proteins from the cell membrane. But Innes and others had caught these MVBs in the act of fusing with the plasma membrane and releasing their cargo—those smaller, membrane-bound vesicles—into the space between the cell’s membrane and its wall. The picture was strikingly similar to the way mammalian and fungal cells discharge a specific type of vesicle called an exosome, which starts out inside an MVB with other exosomes that are set free when the MVB fuses with the plasma membrane. All of us kind of hypothesized at the same time that the only way we could see this phenomenon occurring would be by secretion of the exosomes. Exosomes were first described in immature rat blood cells in 1983, and their discovery was rapidly followed by an explosion of research interest. In mammals, exosomes play important roles in cell-cell communication, immune responses, and malignancy, among other things. Their content can also reflect the status of their cells of origin, which in recent years has made the vesicles a focus of research into biomarkers for pathologies such as traumatic brain injury and diseases such as cancer. Despite a growing appreciation of exosomes’ importance in mammals, nothing was known about exosomes in plants beyond the old microscopy images suggesting their existence. “There were barely even comments on them in those papers,” Innes recalls. He saw the structures in both healthy and dying cells, so they didn’t appear to play a role in cell death, the phenomenon he’d originally set out to study. But Innes was intrigued by what he suspected were exosomes, and he tasked a graduate student, Brian Rutter, with finding a way to purify the structures from the extracellular spaces in Arabidopsis leaves. Exosomes from human or animal cells can be harvested from cell culture liquid, blood, urine, and any number of other bodily fluids. Analogous fluids in plants are not so easily collected—which may be one reason, says Innes, for the dearth of research on plant exosomes. “Without being able to purify them you couldn’t really say what their role was,” he says. Researchers, including Innes and Jin, have just begun to scratch the surface of what plant exosomes do. Some scientists are also beginning to see their potential as useful tools in agriculture and even medicine. As fungal pathogens sink their feeding apparatuses into host cells, plants can fight back by shooting out vesicles packed with defensive molecules. Exosomes start out as vesicles within multivesicular bodies (MVBs), whose source in plants is currently unknown, but may be the trans-golgi network (TGN), which sorts proteins for delivery to various cellular locations. MVBs fuse with the plant plasma membrane to release exosomes into the apoplast, which includes the cell wall and the space between cells. 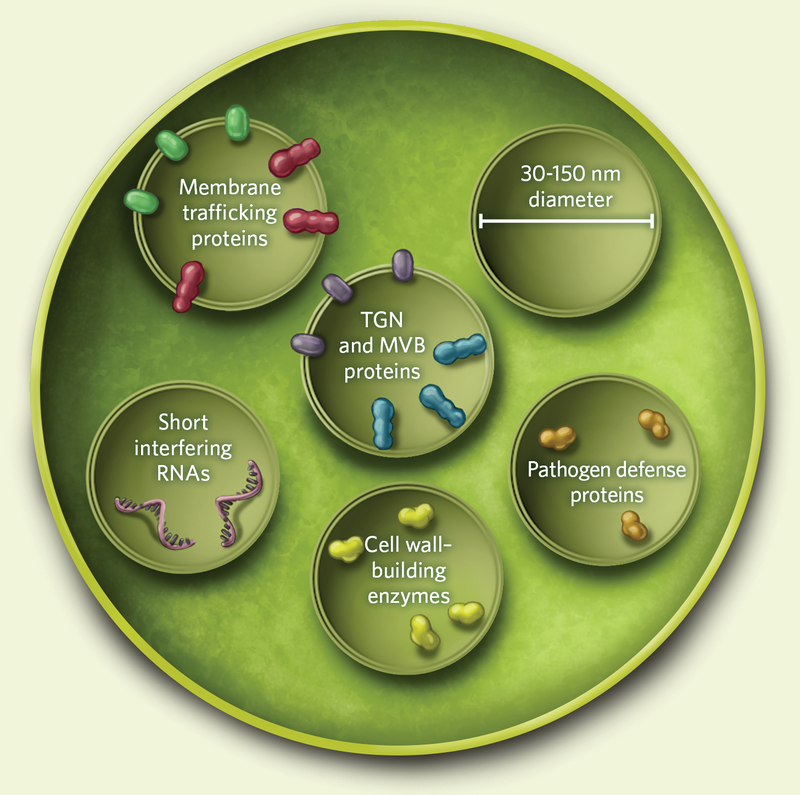 Mounting evidence suggests exosomes have several roles in plant defense. 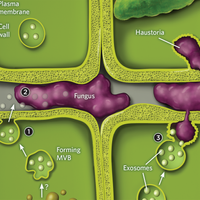 For example, when the haustoria, or feeding structures, of pathogenic fungi penetrate a plant’s cell walls, exosomes may deliver molecules to reinforce the cell wall. Through an unknown mechanism, exosomes can also cross the cell wall and enter nearby fungal cells to deliver fungal defense proteins and short interfering RNAs that disrupt the translation of fungal proteins. Plant-derived exosomes also help establish a protective barrier around fungal haustoria that have established themselves within the cell wall by delivering antifungal molecules and materials such as complex polysaccharides. It’s not clear during which steps of exosome formation and release PEN1 and ROR2 act, but their homology to SNAREs was one of the first hints that membrane fusion was somehow involved in defending plants against fungal penetration, says Mads Nielsen, a plant and soil scientist at the University of Copenhagen. When SNARE proteins on two different membranes latch onto each other, they bring the opposing membranes together and cause them to fuse. When this fusion occurs between an intracellular vesicle and the cell’s plasma membrane, the vesicle’s contents get released from the cell, the same process that MVBs use to release exosomes. Multivesicular bodies (MVBs) fuse with the membrane of a mesophyll cell in an Arabidopsis leaf to release putative exosomes into the intercellular space. An even more tantalizing hint that plants release exosomes came in 2009, when researchers genetically engineered Arabidopsis plants such that PEN1 glowed green under certain wavelengths of light. Outside of a cell, the green fluorescent protein (GFP) tag normally stops emitting light due to a change in pH. But several research groups noticed that PEN1 continued to fluoresce even in the space, called the apoplast, outside plant cell plasma membranes, suggesting the protein was somehow protected.4 “All of us kind of hypothesized at the same time that the only way we could see this phenomenon occurring would be by secretion of the exosomes,” Nielsen says. When Innes and Rutter were looking for a way to validate their technique for isolating exosomes, PEN1 was a perfect marker. Both the protein and the vesicles that they had initially observed appeared in large quantities around the fungal haustoria, where the plant was dumping cell wall materials and proteins to defend itself. “We figured if this protein was accumulating there and these vesicles were accumulating there, then the protein might be in the vesicles,” Innes says. Rutter designed a method to extract apoplast fluid from Arabidopsis leaves by centrifugation and then separated the components according to their density. Among the apoplast contents, he found vesicles containing PEN1 that were between 50 and 200 nm in diameter, similar to mammalian exosomes, which range from 30 to 150. 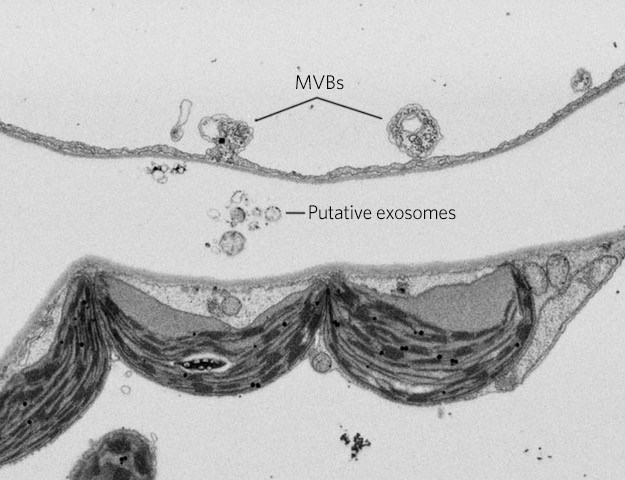 The vesicles also contained proteins commonly found in MVBs, which are known to host exosomes in animals. This line of inquiry, he says, has since led his lab in a number of new directions, as the group anxiously tries to find out exactly what’s inside these putative exosomes and what they do for plant cells. 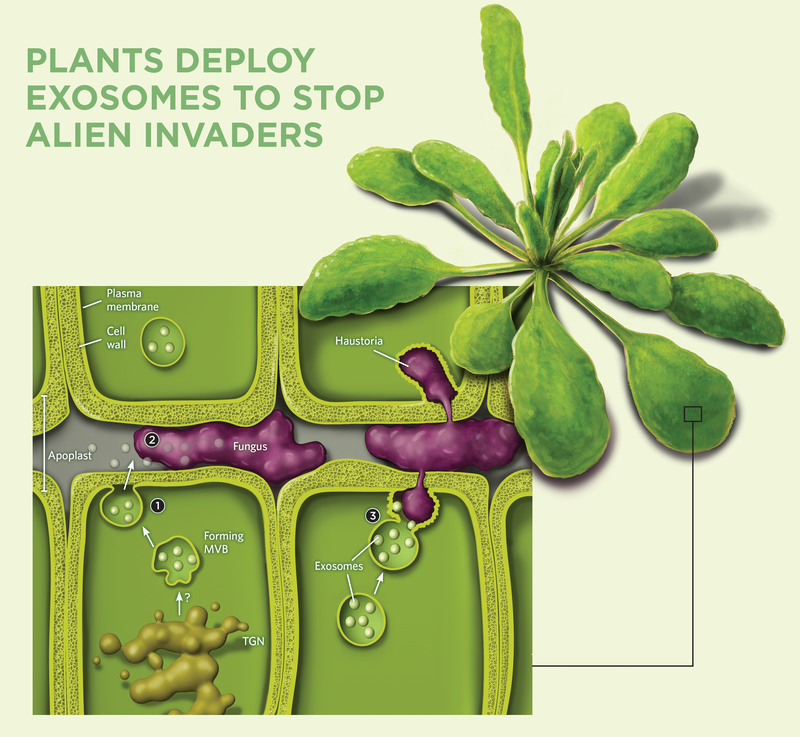 To test exosomes’ role in plant defense, Rutter infected half of his Arabidopsis plants with a bacterial pathogen. He then isolated exosomes from infected and uninfected plants—about 2,000 plants in all—and analyzed their contents by mass spectrometry. Infected plants did have more exosomes in their apoplasts, but Innes says this is likely because infection compromises the cell wall, allowing cell contents to escape, and not due to increased exosome production. And mass spec results were similarly equivocal, with exosomes from both infected and uninfected plants showing enrichment of proteins involved in plant stress responses and immunity compared with the protein content of whole cells. This surprised Innes at first, but he says it probably indicates that plants don’t rapidly make new vesicles at the onset of infection, and just use whatever is already available. “I view them now more as a premade arsenal, and they’re released when they’re needed,” he says. When identifying vesicles thought to be exosomes, plant biologists look for a number of hallmark traits. Innes and Rutter’s study was quickly followed by another from a group led by Laura de la Canal at the National University of Mar del Plata in Buenos Aires, who last year reported that levels of several defense-related proteins were higher in extracellular vesicles from sunflowers than in the plants’ surrounding apoplast.7 The same group incubated sunflower exosomes with fungal cells in culture dishes and found that the exosomes somehow entered the fungal cells and inhibited fungal growth. Jin has some ideas about what exosomes may be carrying into fungi to limit the pathogens’ growth. She has spent most of her career studying how plants use RNA to control the expression of genes involved in pathogen defense pathways. 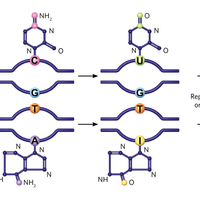 For example, short pieces of RNA can bind complementary strands of messenger RNA to prevent them from participating in the assembly of a protein, a process known as RNA interference. 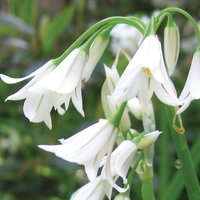 These short RNAs can act within the cell where they were produced, or in other cells of the plant. 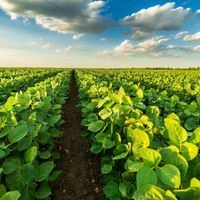 In recent years, Jin’s team and others have found that plants can even send their RNAs into invading pathogens to thwart the attack, a phenomenon called host-induced gene silencing. But for years it was unclear how these RNAs were getting from plant cell to fungal cell or vice versa. “People didn’t even believe that host-induced gene silencing could work because nobody could think that there could be a way for these RNAs to get out of the plant cell,” Innes says. Jin and her team put that uncertainty to bed last year when they reported that Arabidopsis plants use exosomes to deliver short interfering RNAs into invading fungal cells.8 The researchers used a protocol similar to Innes’s and identified exosomes by the presence of a membrane-fusion protein found only in plants, as well as proteins with homology to tetraspanins, a group of proteins found on mammalian exosomes. The researchers also incubated fungal cells with plant exosomes engineered to produce a GFP-tagged tetraspanin protein, and sure enough, the fungal cells glowed green under ultraviolet light, indicating that they must have taken in the exosomes. 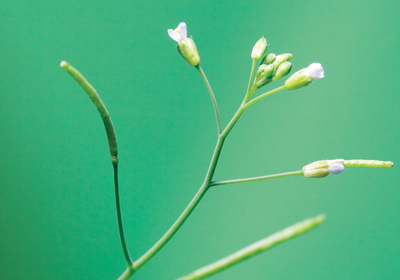 And when Jin’s team infected Arabidopsis plants with a Botrytis fungus, the researchers found 42 different plant-derived short RNAs inside the fungal cells. Then they isolated RNA from purified Arabidopsis exosomes and found 31 of those same short RNAs inside, suggesting that more than 70 percent of the plant RNAs that entered into the fungal cells used exosomes as their ferries. “So, this is kind of answering a longstanding puzzle surrounding this whole concept of host-induced gene silencing,” Innes says. Although their focus has thus far been on exosomes’ role in plant defense, both Jin and Innes are pursuing other undiscovered functions for the vesicles. For example, Jin’s team has found plant exosomes not just in leaf apoplast, but also in phloem, the tissue that transports sugars and other soluble materials throughout the plant. “That means they are moving long-distance,” she says. Exosomes may turn out to be a major route for communication between plant cells. About half of the known extracellular plant proteins lack a peptide sequence that proteins need in order to be shuttled out of cells via exocytosis. Without that peptide signal, it’s been unclear how those proteins get into the apoplast. Jin says several research groups have contacted her for help in purifying exosomes to find out whether those signal-less proteins are compensating for their lack of the special peptide sequence by traveling within exosomes. There are a lot of open questions that previously plant biol­ogists couldn’t answer, and now they feel like exo­somes could provide a very good explanation. But even as researchers understand more about what exosomes can do, Nielsen and many of his colleagues are more concerned with how they do it. Although vesicle trafficking within plant and animal cells is similar, there are key differences that are leaving plant biologists a bit stumped. For example, in mammals, a vesicle called the early endosome acts as a way station for vesicles coming and going around the cell. Special protein complexes within the early endosome sort and load cargo into vesicles, including MVBs, and determine whether a vesicle is destined to transport its cargo to a lysosome to be destroyed or to the plasma membrane to be released from the cell. Plants don’t have early endosomes, Nielsen says, which raises the question, how are their exosomes formed, loaded with proteins and RNAs, and packaged into MVBs, which get sent to the plasma membrane? “We’re still trying to figure out what’s actually going on,” he says. 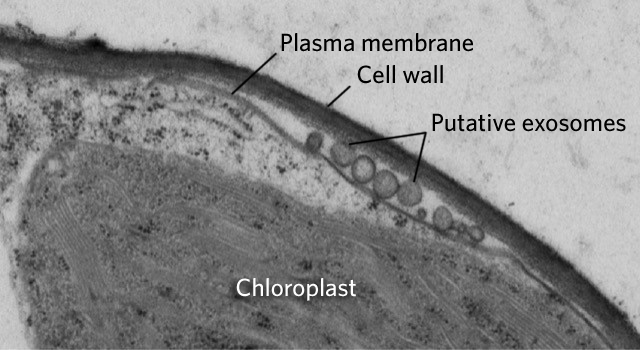 A transmission electron micrograph shows putative exosomes between the cell wall and plasma membrane in an Arabidopsis leaf. Innes says these exosome-like particles have only ever been isolated from whole homogenized plant tissue, which means they represent vesicles from inside and outside the cell. Because of this, it’s still unclear whether exosomes—the only vesicles that leave the cell—truly do carry proteins or RNAs that can affect human biology. Innes’s group is hoping to bring some clarity to that question by culturing cancer cells in the lab with purified exosomes from Arabidopsis and looking for changes in the cells’ gene expression. Amanda B. Keener is a freelance science journalist living in Littleton, Colorado. R. Marchant, A.W. Robards, “Membrane systems associated with the plasmalemma of plant cells,” Ann Botany, 32:457–71, 1968. B.D. Rutter, R.W. Innes, “Extracellular vesicles isolated from the leaf apoplast carry stress-related proteins,” Plant Physiol 173:728–41, 2017. N.C. Collins et al., “SNARE protein-mediated disease resistance at the plant cell wall,” Nature, 425:973–77, 2003. D. Meyer et al., “Extracellular transport and integration of plant secretory proteins into pathogen-induced cell wall compartments,” Plant Journal, 57:986–99, 2009. R.J. Zeyen, W.R. Bushnell, “Papilla response of barley epidermal cells caused by Erysiphe graminis: rate and method of deposition determined by microcinematography and transmission electron microscopy,” Can J Botany, 57:898–913, 1979. Q. An et. al., “Multivesicular compartments proliferate in susceptible and resistant MLA12-barley leaves in response to infection by the biotrophic powdery mildew fungus,” New Phytol, 172: 563–76, 2006. M. Regente et al., “Plant extracellular vesicles are incorporated by a fungal pathogen and inhibit its growth,” J Exp Bot, 68:5485–95, 2017. Q. Cai et al., “Plants send small RNAs in extracellular vesicles to fungal pathogen to silence virulence genes,” Science, 360:1126–29, 2018. J. Mu et al., “Interspecies communication between plant and mouse gut host cells through edible plant derived exosome-like nanoparticles,” Mol Nutr Food Res, 58:1561–73, 2014. J. Xiao et al., “Identification of exosome-like nanoparticle-derived microRNAs from 11 edible fruits and vegetables,” PeerJ, 6:e5186, 2018. X. Zhuang et al., “Ginger-derived nanoparticles protect against alcohol-induced liver damage,” J Extracell Vesicles, 4:doi:10.3402/jev.v4.28713, 2015. Y. Teng et al., “Plant-derived exosomal microRNAs shape the gut microbiota,” Cell Host Microbe, 24:637–52.e8, 2018. J. Mu et al., “Interspecies communication between plant and mouse gut host cells through edible plant derived exosome-like nanoparticles,” Mol Nutr Food Res, 58:1561–573, 2014. X. Zhuang et al., “Ginger-derived nanoparticles protect against alcohol-induced liver damage,” J Extracell Vesicles, 4:10.3402/jev.v4.28713, 2015. Y. Teng et al., “Plant-derived exosomal microRNAs shape the gut microbiota,” Cell Host & Microbe, 24:637–52, 2018.